We don’t have to tell you how important a good night’s sleep is (can you even remember what they are?). Most of us are lacking when it comes to getting sufficient shuteye, and we all have our reasons—colicky newborn, sick tot, unsettled sleeper, stress…you get the picture. It’s a huge part of our overall health and wellbeing—unsatisfactory sleep (in duration and quality) is connected with cardiovascular disease, depression, obesity and type 2 diabetes. According to Statistics Canada, adults 18 to 64 need seven to nine hours each night, but nearly half of men and more than half of women report trouble either drifting off to dreamland or staying there. But it’s not just us parents who need our sleep. Sure, babies and toddlers spend ample hours in slumber every day, but Health Canada says kids five to 13 need nine to 11 hours a night, and they’re not getting it. While a third of children find it tough to go to sleep or stay asleep, about 20 percent have trouble staying awake during the day and 10 percent don’t feel refreshed when they wake up in the morning. This, of course, can wreak havoc on behaviour, school performance and can even cause hyperactivity and poor mental health. 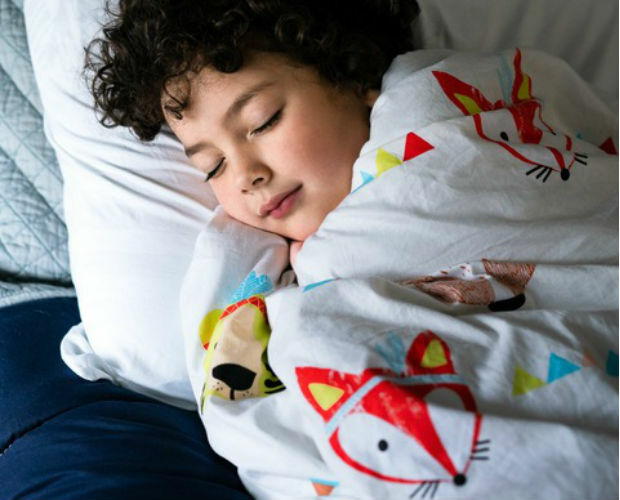 There is a plethora of ways to help kids catch more zzzs, including one that more parents have been introducing to their tots’ bedtime routines. Using a weighted blanket is just like swaddling a babe or being hugged tight, and they’ve been touted for their treatment or help with insomnia, mental health issues (depression, anxiety, obsessive-compulsive disorder), restless leg syndrome, Alzheimer’s and even cerebral palsy in adults, and have even shown some positive results with those on the autism spectrum. Some experts say they can help with sensory, self-regulation and attachment issues. When it comes to kids, manufacturers suggest these shouldn’t be used on infants or toddlers, but they’re safe for kids who are physically able to take off their blanket on their own. The blanket should weigh about 10 percent of the child’s body weight, and whether you opt for blankets filled with glass beads or poly pellets, they should be evenly distributed. Not sure where to go? Here are five of our favourite weighted blankets.